This is a great summer recipe: half the blueberries are cooked; half raw. It's light and refreshing and low in calories (if you can resist serving it without vanilla ice cream!). 2) In medium bowl, mix 1 and ½ cup flour, salt and 3 tablespoons sugar. Cut in butter until it resembles coarse crumbs. Sprinkle with vinegar and shape into dough. At this point, I recommend chilling the dough for a half hour as it’s very sticky otherwise, but you can skip this. 3) With lightly floured fingers, press dough into pan (I use a larger pottery dish for this but you can use a 9-inch spring form pan in which case you’ll use less of the dough and only 5 cups blueberries). Spread the dough about 1/4 inch thick on bottom, less thick and 1/2 high around sides (1 inch if you use a spring form pan). 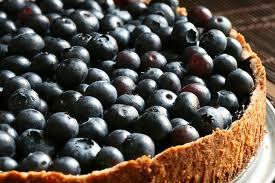 4) Mix 3 cups of the blueberries with remaining 2 tablespoons flour, 1/2-cup sugar and cinnamon. Spoon the mixture on top of the dough. 5) Bake on the middle rack for 35-45 minutes, or until crust is golden brown and the filling bubbles. You might want to put foil under it as blueberry juice can spill over, depending on the baking dish you use, and make a mess in the oven. 6) Remove from oven and place on a cooling rack. 7) Top with remaining 3 cups raw blueberries. They kinda mush together which is just what you want. Cool for at least 30 minutes. Run a pairing knife around the crust edge to separate from the pan before opening spring form. In my pottery dish, I've never had any trouble getting it to come out in neat slices.